Brian Burke, president and general manager of the Toronto Maple Leafs, announced Wednesday that the club has agreed to terms on a three-year entry level contract with forward Jerry D’Amigo (pronounced dah-MEE-goh). D’Amigo, 19, appeared in 35 games with the R.P.I. Engineers of the ECAC last season, recording 34 points (10 goals, 24 assists) and 41 penalty minutes. The 5-11, 208-pound winger ranked fifth nationally in points per game by a rookie (0.97), led R.P.I. in game-winning goals (3), and finished second in shorthanded goals (1). For his efforts, D’Amigo was selected to the ECAC All-Rookie Team and he was named ECAC Hockey’s Rookie of the Year. 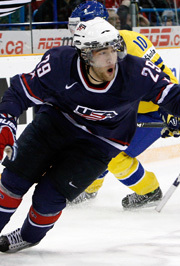 The native of Binghamton, New York, represented the United States at the 2010 World Junior Championship in Saskatchewan. D’Amigo finished tied for third in tournament scoring with 12 points (6 goals, 6 assists) in seven games to help lead Team USA to a gold medal. D’Amigo was selected by Toronto in the sixth round, 158th overall, in the 2009 Entry Draft.